Great Wolf Lodge in Grapevine Texas is the only place you can go to experience a huge indoor waterpark; stay in guest rooms designed like beautiful north woods cabins and dine in restaurants that will make you feel like you are camping under the stars. 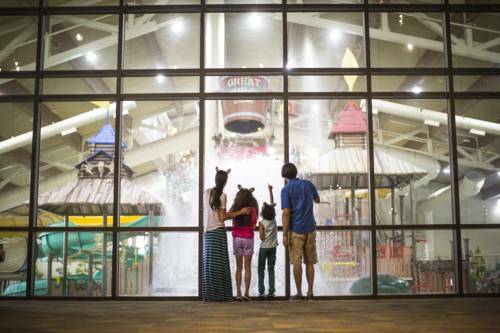 At Great Wolf Lodge our gigantic indoor waterpark is reserved exclusively for our guests. That means we are saving lots of howlin waterpark fun just for you and your pack. So soak yourself under our 1000 gallon tipping bucket; lounge in the endless lazy river; zip down one of our fantastic tube slides or splash in our zero-depth entry pool. Great Wolf Lodge does not do anything in a small way. Be sure to venture to our Cub Club rooom that has family friendly crafts and activities. Or let your kids run wild with our live action adventure game called MagiQuest - for an additional fee. And when the kids are ready check out Scooops our ice-cream themed kids spa designed just for the 12 and under set. Loose Moose Cottage: Open daily for breakfast. If you wake up hungry like a ... you know what ... head for the giant breakfast spread at Loose Moose Cottage. Pile your plate with made-to-order omelets and waffles hash browns bacon muffins cereal fruit and more. Starbucks: Get your caffeine jolt at our full-service Starbucks coffee shop. Our baristas can prepare cappuccinos lattes and any other beverage to satisfy a grande craving. Spirit Island Snack Shop: With so many slides to choose from its easy to work up an appetite. Luckily you do not even have to leave the waterpark. Head here for cheeseburgers hot dogs pizza hot pretzels soft drinks adult beverages and more. Pizza Hut Express: When that pizza craving hits order a piping hot personal pie at the Pizza Hut Express. Hungry as a Wolf: With choices like homemade pizza bread sticks salad or a Wolf It Down family meal your pack is sure to agree on the perfect meal.